The Hidden Canyon Trail climbs the east wall of Zion Canyon to a side canyon featuring a narrow slot, a free standing arch and a series of challenging scrambles. Steep drop-offs en route may discourage some, but those who reach the Hidden Canyon entrance will enjoy great views across Zion Canyon and the option to explore this intimate slot. The Hidden Canyon Trail climbs 810' in just one mile through riparian systems on the canyon floor, hanging gardens where springs seep from sandstone walls, deciduous clusters of maple and oak and coniferous stands of ponderosa and fir. 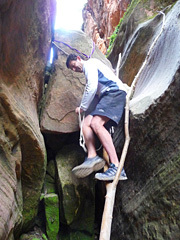 Narrow, slickrock ledges can be hazardous. Avoid hiking when wet and descend these sections before storms arrive. Slot travel requires athleticism and moderate-advanced scrambling skills. Follow signs from the Weeping Rock shuttle stop to the East Rim Trail. The East Rim Trail climbs steeply on rough-pour switchbacks to the Observation Point - East Rim Trail - Hidden Canyon Trail junction (.55 miles : 4.805'); bear right towards Hidden Canyon on what are now quick intervals of packed dirt and uneven sandstone. Magnificent panoramas of The Spearhead, Angels Landing, The Organ and the Big Bend in the Virgin River emerge on this fast climb. The trail curls to a deep, shaded crevice in the main canyon up which stone steps lead to the first of several narrow, chain-aided ledges (.75 miles : 4,945'). Be mindful of others sharing and negotiating these tight spaces. The ledge curls inward once more (.9 miles), circumvents a natural pothole and rises one final time along notched-stairs blasted in sandstone to the Hidden Canyon entrance (1.0 miles : 5,130'). Those continuing on will enter the canyon and immediately veer left, up and over the first obstacle. Once through you'll be dwarfed and confined by tall walls and minimal natural light. Not far in, up and to the right is the arch, which lies relatively flush with the canyon's east wall. Travel is more challenging as you progress, with one of the toughest approximately .6 miles in where a dry fall can only be scaled with rope assitance. Steep drop-offs make this trail unsuitable for anyone fearful of heights. Avoid hiking when wet or when storms threaten. Some canyon obstacles are more easily scaled up than down. Only confident, experienced scramblers should push deep into Hidden Canyon. Take the Zion Canyon Shuttle to the Weeping Rock Trailhead.